Like a winter day that undresses the leaves from the trees, we had a similar situation with the swell and our Banana stalk. Each wave that passed grabbed a banana loose as it slapped our hull. At first it seemed rhythmic and slow, but then the bananas must have lost their support and the rate at which they fell seemed to increase exponentially until all that remained was a bare stalk with two lone soldiers. Below, strewn across the starboard bench and cabin flour, lay a heaping pile of fallen bananas. There were 75 and we were completely taken aback by the absurdity of it all. It was a mushy crime scene! We were bent over laughing, bracing ourselves, with legs crossed trying not to pee and tears rolling down our cheek. One glance at the mess and we’d start right back up again, incapacitated by deep guttural laughter. Time to clean up this Banavalanche mess and start getting creative with banana recipes. 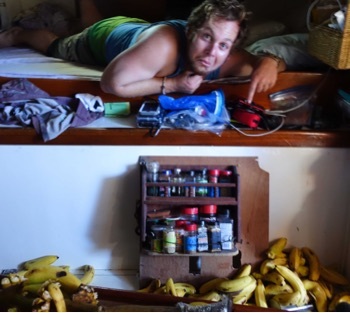 Perhaps this is where the superstition with bananas came from…! hahahahahahaha!!!! 75 ripe bananas !!!!!!! First thing that comes to mind: banana bread, banana muffin, oh my God! you don’t have an oven !!! What is the superstition with bananas?! Oh goodness bananageddon is hilarious!! Freeze them for smoothies, that’s what my daughter does!